Despite a dozen years of growth in the industry, some people in the business are wondering aloud if the “post-craft” era is nigh, and some are embracing the opportunity to broaden their appeal. 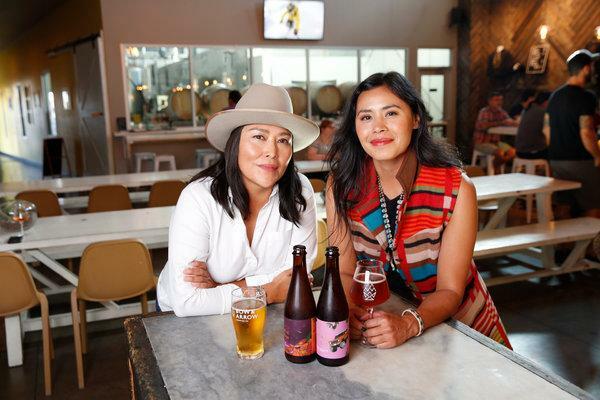 From niche beers to inviting taprooms and branding, the business is formally investing in its cultural diversity as never before. Not just because brewers think it’s the right move — because it’s a smart move, too. “If you are going to grow, you cannot simply sell beer to young white dudes with beards,” J. Nikol Jackson-Beckham said in May, in her opening address as the first diversity ambassador for the Brewers Association, craft brewing’s largest trade group, which represents nearly 7,000 small, independent brewers. Over the last year, she has traveled to brewers’ guilds and industry conferences, and developed guidelines and resources to help brewers make their workplaces, customers and brands more inclusive. She also worked with organizers of the inaugural Fresh Fest, an event in Pittsburgh last August that billed itself as the country’s first for African-American beer enthusiasts, in what she called a “pilot case” that will inform how the association can best support more events like it. Dr. Jackson-Beckham, who teaches at Randolph College in Lynchburg, Va., has been a home brewer and beer scholar for years. Her appointment last spring was perhaps the most significant and visible move yet in an industrywide effort to make craft brewing culture as diverse as its beers. Even as domestic sales of craft beer reached a record-setting $26 billion in 2017, that figure was just eight percent higher than sales in 2016. In most industries, those numbers might be cause for celebration, but for American craft brewers, who enjoyed even stronger boom times earlier in the decade, it looks more like a slowdown. For years, macrobrewers like Anheuser-Busch InBev and MillerCoors have pitched their brands to minority and underserved populations to shore up sales as one-time customers switched to wine, spirits or even craft beer. But brewers must walk a fine line as they seek to diversify their staffs and their fans, so the changes do not come off as a feeble attempt to make money. Marketing “is where a lot of the conversation and press has been,” said Dr. Jackson-Beckham, noting that in recent years, the online craft beer community has policed offensive beer labels and names, and criticized the brewers behind them. Bow & Arrow’s Rancho Bizarro is a series of sour ales with label art created by the indigenous illustrator Dale Deforest. The brewery has also used Navajo tea in a limited-edition grisette beer, with plans to incorporate more indigenous ingredients in new brews. Making beer Baja-style to celebrate the Mexican brewing tradition requires a level of cultural appreciation and sensitivity. “There’s ways to do things and be culturally appropriate” and not engage in cultural appropriation, Dr. Quintero said. Staffing is another way breweries are becoming more inclusive. If there’s someone who looks like you behind the bar, the logic goes, you may feel more comfortable ordering a pint. “We bring a lot of diversity into the community just by being a bar that employs people who are not old white people,” said Erik Lars Myers, a founder of Mystery Brewing Company in Hillsborough, N.C. Still, embracing cultural diversity is no panacea for the realities of a competitive market. Despite Mystery Brewing’s earning national acclaim for brewing a fund-raising “protest beer” in dissent of North Carolina’s contentious “bathroom bill,” it closed in October, citing undercapitalization and bad luck. And not everyone who likes craft beer feels the same way about social progress. In April, Tired Hands Brewing Company, a craft brewery in Ardmore, Pa., posted a job for a diversity internship, hoping to draw female and minority student applicants. On social media, reactions were hostile. Last summer, Tired Hands hired its first diversity intern, a female college student, for a three-month program focused on developing beer production skills. Julie Foster — a Tired Hands owner whose husband, Jean Broillet, is the brewery’s founder and brewer — hopes to continue the initiative, and expand it. Dr. Jackson-Beckham spent much of 2018 “listening and learning” from brewers across the country. This month, the Brewers Association published her “diversity best practices” to help like-minded craft brewers think of inclusion while growing their businesses.